Homemade cleaning recipes are becoming a new trend. Rising costs of.....well, everything, have led people to look for more and more ways to save money. And lets face it, cleaning products are expensive. How many times have you gone to the grocery store and found that your cart was almost full and you hadn't even reached the food aisles yet? We spend hundreds and hundreds of dollars a year on trying to live cleanly, something our great grandparents did without spending much money at all. As time has progressed our society has become used to buying what we need and has forgotten how to be self sufficient. Not only is it too easy to buy our cleaning supplies, most of us aren't even aware that they can be made at home. For pennies a day we can easily make great household cleaning products that do not contain harmful chemicals and do not use expensive, wasteful packaging. You can use any bar of soap to make liquid homemade laundry soap or use the recipe below. Have lots of soap shavings from trimming your bars? You can recycle them into homemade laundry soap as well. Distilled Water - 297 gr. | 10.48 oz. Lye - 150.49 gr. | 5.3 oz. *Palms SAP value is 0.142 and lards is 0.141 so there isn't any need to adjust for the lye. Prepare the soap using the cold process method, insulate as normal and cut the soap into 10 bars as soon as it has cooled. There is no need to cure the soap and it will last for a very long time. Wear gloves when grating fresh soap. When you're ready to make the liquid laundry soap, place half a bar of finely grated soap (about 2 ounces) into a pot with 4 cups of boiled water. Heat gently until the soap melts and then add 1/2 cup of borax and 1/2 cup of washing soda (or baking soda if you can't find washing soda) to the pot and dissolve. Remove from heat and add 8 cups of cold water, one or two tablespoons of essential oil (sweet orange is nice and cuts grease), and 1/2 cup of white vinegar. Pour the mixture into a jug or bucket and cover. Use 1/4 - 1/2 cup per load and add 1/4 cup of dissolved borax for whites and extra dirty loads. Stir or shake before use. For stubborn stains, rub the bar soap on the dampened stain and let sit for a 1/2 hour and then wash as usual. You can use 1/2 cup of vinegar (plain or scented with a deodorizing essential oil) in the rinse cycle as a softener and to keep your machine clear of build-up. 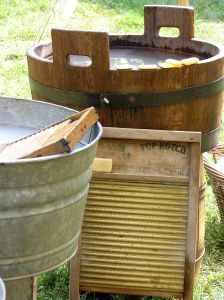 Thinking about selling homemade laundry soap? You could package a powdered mix of pre-grated soap, borax and washing soda along with directions for making the liquid laundry soap. Do not use bleach with this homemade cleaning recipe. Bleach reacts with vinegar to create a gas that is extremely harmful to breathe. If you use bleach on a regular basis, simply omit the vinegar from the laundry soap recipe. Automatic dishwasher powder is extremely easy to make. Simply mix the following two ingredients and your dishes will come out clean and bright. Fill the dishwasher's soap dispenser with the premixed powder and add vinegar to the rinse agent dispenser. Here is a great replacement for those overpriced, stinky, chemically loaded bathroom cleansers. This is one of those homemade cleaning recipes that is simple to make, a breeze to use and so cheap it must be a mistake! Liquid Soap - 2 Tbsp. Essential Oil - 2 Tbsp. Combine baking soda, washing soda and borax. Blend in the liquid soap and the essential oil until completely mixed and powdery. To use: Wet surface and sprinkle with small amount of powder. Wearing rubber gloves, scrub surface with a sponge or cloth. Rinse well. Your surfaces and fixtures will sparkle!! Do not use on aluminium or fibreglass. My favourite household cleaner because it's super simple and super effective! This economical spray easily cleans that nasty tub ring and shines up your fixtures. Can be used on mirrors and glass as well. Place both ingredients into a spray bottle and shake. That's it! Start spraying your way into a shinier home. There's nothing quite like walking into a kitchen that smells fresh, crisp and clean. By using different essential oil blends in this homemade cleaning recipe, you can make multiple sprays for specific cleaning purposes or just to suit your changing moods. Sweet Orange E/O (grease cutter) - 1/2 tsp. Essential Oil - 1/2 tsp. Combine all ingredients in a good quality spray bottle and shake before each use. Sometimes certain areas of the home need that little extra boost of freshness. Pick your essential oil blends for this homemade cleaning recipe to deodorize and disinfect the odours rather than cover them up. Combine all ingredients in a fine mist sprayer and shake before each use. Protect your wood furniture from drying out with this oil based furniture polish. Essential Oils - 1/2 - 1 tsp. Melt the wax into the oil and when slightly cool, add your essential oils. Pour into a wide-mouth jar and allow to solidify. To use, apply a thin layer on the furniture using a circular rubbing motion and then wipe clean with a cotton rag. Before use, test the wax on your furniture in an inconspicuous area. Are your sink drains acting sluggish? Apply this simple homemade cleaning recipe once a week to keep those sinks running smoothly. Sprinkle baking soda down the drain, follow with the vinegar then put in the drain plug. Leave to set while you boil the water. Once the water has boiled, remove the plug and pour the boiling water down the drain. You're not going to believe it but club soda will remove stains from your carpet. This has to be one of the simplest homemade cleaning recipes you'll ever find. Open a new can of club soda and pour a small amount over the stain. Using a soft brush, gently work the soda into the stain using a circular motion. Take a dry cloth and dab up the soda and the stain. Easy!